Khubz is an Arabic flatbread that is part of the local diet in many countries on the Arabian Peninsula, Lebanon, Palestine, Syria and Jordan. The Arabian-style Khubz may also be called Khuboos or Khubus. In the Arabian Peninsula region, Khubz refers to a large flat bread baked in a special oven often called a "tannuur". 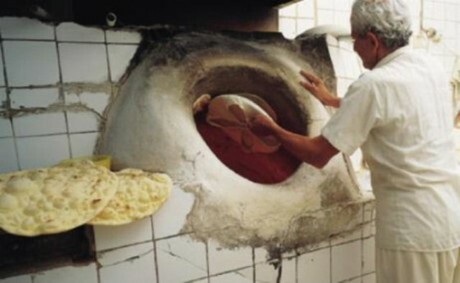 The dough is rolled out like a pizza dough then it is positioned on a round board and slapped on to the inside wall of the large round stone oven. The impact of the slapping action causes the dough to stick to the wall of the traditional oven, where it remains until it is bubbling and brown and cooked through, then a long wire hook is used to remove the finished Khubz and throw it over to a tile counter where it is ready to be sold. The whole process is carried out by two or three men. The Khubz is similar in appearance to other Asian flat breads like Persian Nan and the Indo-Pakistani Tandoori Naan. It is much larger than a 'Pita' bread and, unlike Levantine Khubz, this version is flat and has no pocket. Levantine Khubz is identical to what in the West is referred to as Pita, although the term Pita is unknown in the Middle East. It is made in a conventional bread oven. Flat disks of rolled dough are placed on the hot oven floor using a bread peel. The Khubz cooks rapidly and puffs up to form the "pocket" within seconds. Khubz is made in different diameters and thickness, depending on the bakery and local preference.